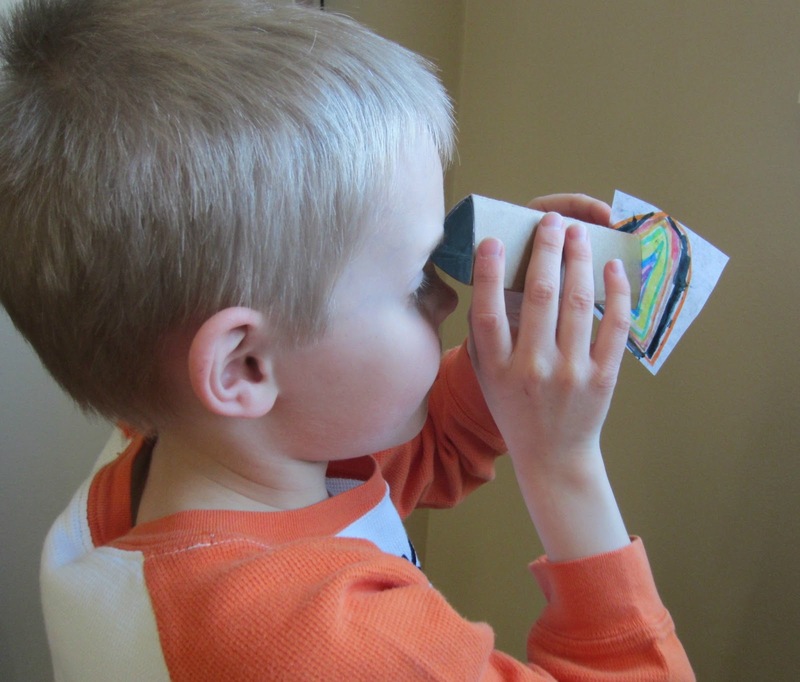 Did you have one of those cardboard tube kaleidoscopes as a kid? I did. And I still remember how magical it was to turn it and see the patterned colors change before my very eyes. As an adult I've ogled those fine art kaleidoscopes made of glass and mirrors a few too many times to count. So when I was thumbing through 50 Science Things to Make & Do by Georgina Andrews and Kate Knighton, the kaleidoscope craft immediately caught my eye. Could it truly be done? Was it really that simple? The answer to both questions is yes. And, boy oh boy, is this cool. Fold your piece of cardboard in half so the short edges meet. 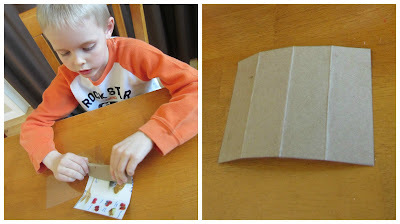 Then unfold, and fold each of the ends in to the center fold, so that your chipboard rectangle has three heavy creases. Put the piece of clear plastic over the top of your chipboard. 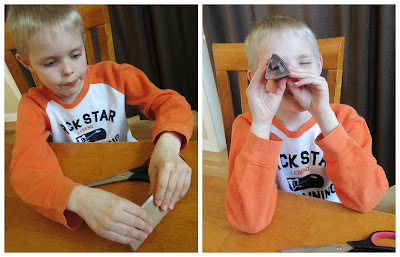 Now use a ruler and scissors to score the plastic where the folds are on your chipboard. Set the plastic aside for now. Put glue all over the chipboard and top with aluminum foil (shiny side up). Trim the excess. 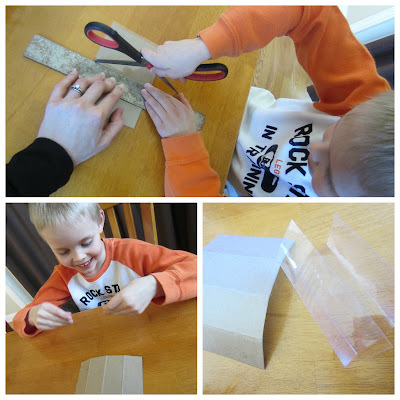 Lay the scored plastic over the foiled chipboard and fold into a triangular shape (one side with overlap). 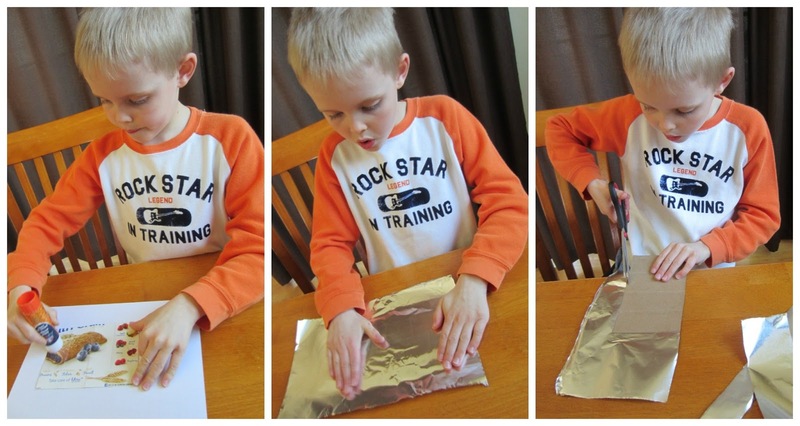 The foil and plastic should be inside the triangular tube. Tape to close. Cut a small square of tracing paper that's bigger than the triangular opening of your tube (ours was about 3- by 3-inches). Using markers, add a colorful pattern to the paper, filling most of the space with bright colors. The pattern will work best if it radiates out from the center. Now hold the triangular tube up to the light, put it to your eye, and look through it; place the tracing paper pattern over the open end and turn it. Light will shine through the tracing paper and the pattern will be reflected off the sides of the plastic-covered foil, creating a magical transformation of colored shapes. 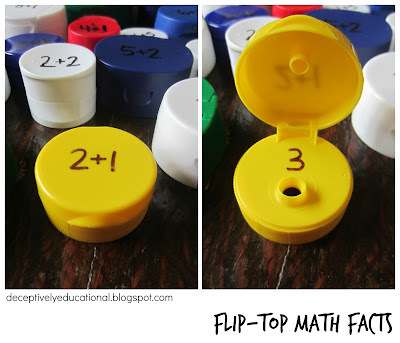 Want to try other great ideas like this one? Get the book 50 Science Things to Make & Do! Could that BEE a Synonym or Antonym?